"How to Strip Wood Furniture"
Is Stripping the Right Option? In the article Repair vs. Refinish, there are lists of problems that help you to classify the damage to the finish on your funiture. There are a few different options based on the extent of the damage. Stripping the existing finish with paint and varnish remover is the most invasive of the options and should be reserved for pieces that are in poor condition or you want to improve. If you're not sure that stripping and refinishing is your best choice, click on the article and read about the other options first. Removing an old finish is a messy job that is best done outdoors. To make a work area, start by covering an area of the driveway, garage/car-port, or yard with cardboard to catch and collect the drippings that always seem to occur no matter how carefully you work. The cardboard should extend a few feet beyond the piece you're working on in each direction. Make sure there isn't anything nearby that you don't want the stripper to get on; it will damage whatever it contacts including the paint on your car. Working outdoors not only helps to contain the mess, it gives you plenty of fresh air so the fumes from the chemicals don't build up. You'll be working with strong chemicals, so protect your eyes by wearing splash proof goggles and your hands and lower arms by wearing chemical resistant gloves (nitrile gloves work well). It's a good idea to have extra gloves on hand in case they get holes in them. Wearing a long sleeve shirt and a rubber apron will help protect you from getting any stray stripper on your skin. Of the different types of stripper available, I like to use a semi-paste stripper that contains methylene chloride (MC) because it works quickly on most finishes. The contents label on the can will tell you what's in it, and the heavier the can, the higher the MC content. The semi-paste consistency evaporates a lot slower than liquid stripper and gives you more working time. Use an inexpensive, disposable natural bristle brush (the stripper will dissolve synthetic brushes) and slather on a thick coat of the stripper. Don't brush it back and forth or the solvents will evaporate too quickly. The semi-paste stripper contains wax that floats to the surface while it's sitting and seals the solvents in so they have time to work on the finish. Start by pouring some of the stripper into an empty coffee can or paint can. Using the separate container with the large opening will make it easier to use and avoid spills. You can get empty quart and gallon metal paint cans with lids from your local home center or paint store. 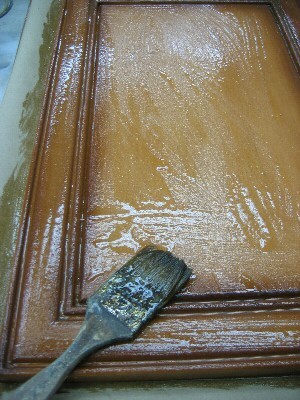 Use the brush to slather on a thick wet coat of the stripper, spreading it quickly and evenly. For larger areas, you can pour the stripper onto the surface and use the paint brush to spread it out evenly. A good coat of stripper will look like the door in the picture on the left. Some areas are thicker than others, but the entire surface is wet, and trying to spread it more evenly will only make the solvents evaporate too quickly. If you have dry spots, add more stripper on those areas. Depending on the finish that's on the piece, it may soften, dissolve, or wrinkle as the stripper does its job. Finishes that cross-link as they cure (varnish, waterborne, oil and latex paints, and catalyzed coatings) are not fully dissolved by the stripper but many will swell up and wrinkle. 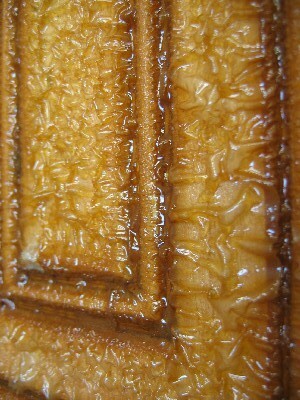 The drawer face in this picture shows a good example of a finish that wrinkles as the stripper works on it. After letting the stripper sit for 10 minutes or a little longer, you can check to see if the finish has softened/dissolved enough to be removed. If it's wrinkled up you know it's ready, but if it doesn't, you can do a little test using a scraper to see if the finish comes off easily. If the finish doen't come off with light pressure, either give it more time or lay down another wet coat of the stripper over the existing stripper. After 30 minutes, the finish should have softened as long as the stripper has enough strength for the type of finish you're removing. Once the finish has lost it's bond to the wood, use a plastic scraper, metal scraper, a stiff bristle brush, or scotchbrite to remove the softened/dissolved finish. On flat areas, the scraper is the quickest. If the stripper dries too much before you remove the finish, just add more and let it sit for less time. If you use a metal scraper, round the corners a little with a file or grinder to avoid scratching the wood. In most cases is won't take a lot of effort to scrape off the finish once the stripper has done its job. 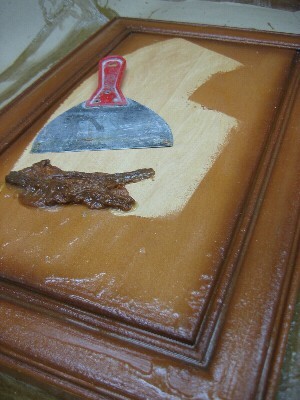 But if it's one of the more durable types, you will have to apply more pressure to scrape the finish off.